A successful social media marketing campaign depends on a thorough understanding of the audience you want to target for your school. Taking the time to conduct a social media audience analysis before you launch or ramp up your marketing efforts can improve its performance and get the best return on investment (ROI) for your budget. The place to start is with actionable analytics that will help you analyze your audience. Knowing exactly who your audience is – and where they hang out online – will help you craft content that you know your audience will love and engage with before you create it. You will cut down on your outbound expenditures, giving you more capital to invest in other tactics once your social media campaign is fully operational. Your analysis will be used to inform the design of materials, messages, media selection and activities of your social media strategy. It establishes a realistic picture of the audience you want to target for your school. As a result, messages are more likely to resonate with your audience and lead to increased enrollments. In general, you will want a small team to work on the audience analysis. Usually, this will be your marketing manager and staff. Stakeholders should be involved in the process as well. Think about the best ways to engage your school’s stakeholders in the process to gain their input and feedback. Some schools have used in-depth interviews, focus group discussions, community dialogs, small group meetings or stakeholder workshops. Here are the 10 steps to follow to conduct a social media audience analysis. Use audience insights from social media to collect data about your current audience. Log into Twitter Analytics. Click on Audiences. You will see your audience’s key demographics, interests, and languages. Go to your school’s LinkedIn Page and click on the Analytics tab. Here, you can see your followers and the industries that make up your audience, including company size and job function. Go to Facebook’s Audience Insights tool. In the Choose an Audience to Start window, select People Connected to Your Page. Enter your Facebook Page URL in the box that says People Connected to Your Page. 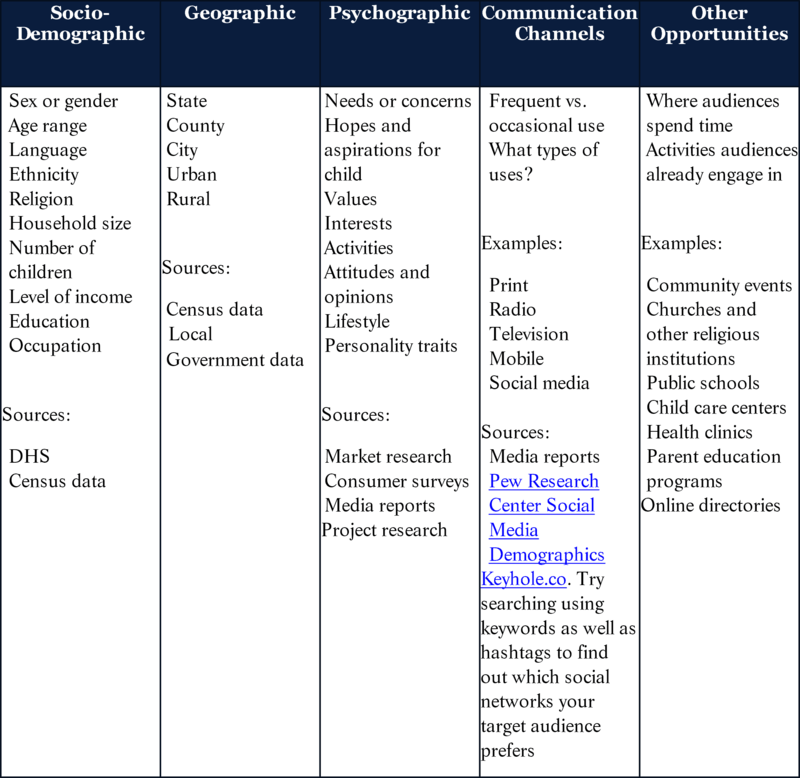 From there, you can see demographic and buying behavior data about your social media audience. Navigate back to the Choose an Audience to Start window. Select Everybody on Facebook. Select a competitor’s Facebook Page as an Interest category. This will show you the demographics and behaviors of your competitor’s social media audience. Brainstorm and list all potential audiences that would make sense for your school’s marketing campaign to target. In order for your market efforts to be successful, you need to identify the most important audience(s). When choosing your audience(s), consider who has the most invested in selecting the right school for their child and who has the control or resources in order to make a decision. Consider your current audiences as well as the ones you have brainstormed. Exclusive FREE Bonus: Download the pdf How to Conduct a Social Media Audience Analysis to reference in the future and/or share with colleagues in your school. Identify the characteristics of each target audience you have selected. Here is a reference table. The next step is to identify what your selected audience knows, feels, thinks, and does related to enrolling their child in your school. This allows you to tailor your messages and activities based on the audience’s knowledge, beliefs, attitudes, and behaviors.Here is a list of ideation factors that commonly influence individual behavior. These should be considered when determining your target audience’s knowledge, attitudes, beliefs, and behaviors. What does the target audience already know about your school (or type of school)? How does the target audience feel about your school? How does the target audience see their role with respect to making a decision about whether to enroll their child in your school? Does the target audience feel at-risk for a problem related to enrolling their child in your school (or a competitor’s school)? How at-risk do they feel? What social norms might your target audience experience related to enrolling their child in your (or a similar) school? What emotional reaction does your target audience have towards your school (or similar schools)? What type of social support do you think your target audience will receive related to electing to enroll their child in your school? How likely do you think your target audience is to reach out to your or someone on staff if they are interested or have questions about your school? It’s important to know what stops or encourages your target audience to contact your school. What barriers prevent your target audience from contacting you? What facilitates them taking the desired action? Availability. Do you have someone available to address the needs of your target audience on a regular basis? Accessibility. How easy is it to contact your office? Are they likely to take the time and effort to access your enrollment office? Affordability. Does your target audience perceive that they will be able to afford your fees? Acceptability. Is it socially acceptable for your target audience to enroll in your school? What are the existing practices and traditions in their family and/or social circle? Audience segmentation is the process of dividing your audience into groups that share a common characteristic that will affect their willingness to discuss enrollment with your enrollment officer. It is common to segment target groups by where they are at in their “customer journey,” but other types of segmentation might be advantageous. Use the following criteria to determine whether an audience needs to be segmented further. Is a sub-group of your audience particularly hard to reach, requiring different channels? Do any of the members of your audience have distinct views or concerns about enrolling their children in your school that may require a different message? Do any of the members of your audience need extra attention or interventions? Influencers can be individuals or groups. They can have different roles in the lives of your potential enrollees such as friends, family, teachers, health care providers, leaders or the media. Who has the most impact on your target audiences’ school-related behaviors and what is their relationships with your target audience? 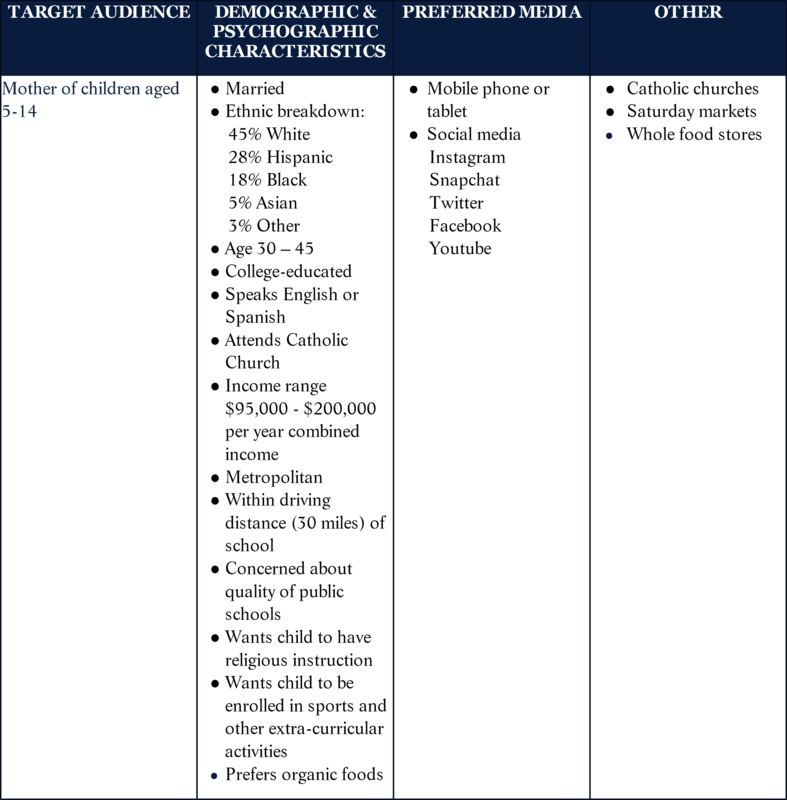 Who makes or influences your target audiences’ decisions in the area of school enrollment? Who influences the target audience positively and negatively? What is their age, income level, gender and marital status? Where do they live? Who else lives in the home? Who are the neighbors? How many children do they have and how old are they? What type of goals do they have for their child? What are their hopes, dreams, and aspirations for their child? Do they have savings? If so, how much? What type of family activities do they enjoy? What is this person’s greatest worries in life and how does he/she deal with them? What do his/her friends and family think or do that might impact their decision to enroll their child in your school? How do traditional gender roles influence this person’s life? What type of work does this person do for a living? How do friends and co-workers describe this person? Who are this person’s closest friends? What do they have in common with each other? What does a typical day in this person’s life look like? How might enrolling his/her child in your school impact their current daily routine? What does this person think or feel that might make it easier for them to decide to enroll their child in your school? A social media audience analysis is essential for determining which social networks your audience lives on, the best tools to use to gather demographic and behavioral data for your target audience, and target your ideal prospective families with content they will love and want to share. Have you used a social media audience analysis for your school’s marketing plan? What tips can you share with other school marketing professionals? Please comment in the SchneiderB University Facebook Group by clicking here.